In an attempt to add a little (relatively healthful) variety to my usual breakfast of oatmeal, I bake batches of granola made of rolled oats and barley, nuts, wheat germ, dried coconut, and flax seed, all of which is lightly moistened with a mixture of canola oil and maple syrup and then roasted until lightly browned. After cooled, I add raisins, dates, or other dried fruit. 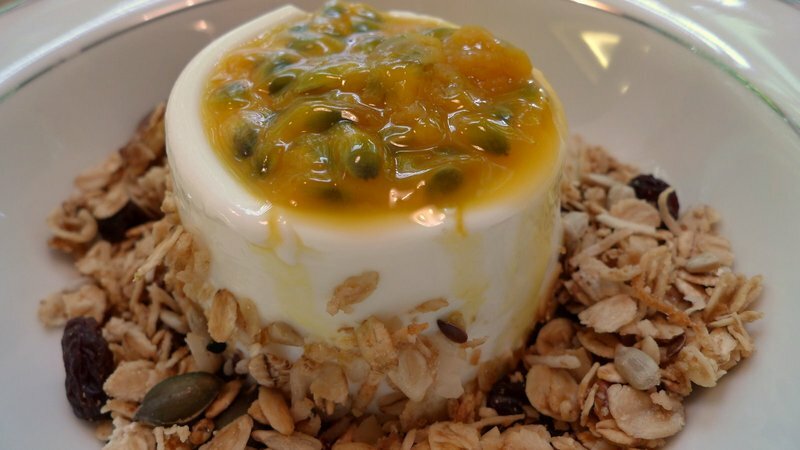 Served with some plain yogurt and some fresh fruit – in this case, passion fruit pulp – it makes for a nice breakfast, no? I’d like to believe it is also a healthful but in addition to the whole grains and good fats, I think it is pretty high in calories. Thoughts? This entry was posted in Uncategorized and tagged breakfast, Brunch, cooking, food, Granola, health, Muesli, Yogurt by christao408. Bookmark the permalink. You can cook for me anytime. I’ve found that it doesn’t take too much effort to have a healthy breakfast. Cooking oatmeal can be a bit of a pain if you’re in a hurry. But I think if I can organize myself a bit better, I can have a bit more time at breakfast. Did you use low fat yogurt? It may be a bit high in fat, but you could compensate for that with your other meals and snacks for the rest of the day. I’ve never eaten passion fruit. It looks to me like the texture would be too slimey for my palate. Not that I won’t try it if someone prepared it for me. I just never felt like I wanted to prepare it and eat it myself. I made a delicious smoothy yesterday using Kefir and frozen strawberries and blueberries with a teeny tiny spoon of Stevia. Delicious. Have you used Kefir? I’m from the old country. Where we eat a hearty breaksfast. You know…scrambled egges, bacon, toast, orange juice and a hot cup of coffee. Besides you only live once. So live it up ! My palate is overwhelmed. Vicariously. wow, that looks delicious! you should come and make me breakfast sometime… that’d be great to have after a run! my breakfasts usually just consist of some cold cereal and milk (or sometimes in the winter, hot oatmeal). I’m impressed – that yogurt looks homemade! I’d vote for a different fruit on top as the passion fruit is not a favorite of mine. If it was mango – well, I might tackle you from behind, and grab the bowl before it hit the floor and sprint to a safe spot with a lock on the door to consume it. So maybe I like my yogurt and homemade granola looks mighty tasty. As for healthy – fiber, protein, fruit what’s the problem? Oh yeah, calories… but they are healthy calories. Not like beer. I think it is perfect for breakfast Chris. I wouldn’t worry about the calories. Breakfast is the most important meal and if you cut down on your calories through the day, this will be a wonderful choice to make. It is not about the calories. You have to have a balanced diet. You could eat 10000 calories a day if you burn off 75% of them. I don’t remember the last time I ate breakfast. I agree with Dr. Zsa…Breakfast is so important to get the body up and “running” after a night’s rest. Better to eat nutritious calories then and be careful the rest of the day. I add my dried fruit to the last 15 minutes of baking (300o F oven). Bon appetit. healthy calories though.lots of texture for sure! that looks absolutely delicious… AND… i love how you said healthful not “healthy” it’s a pet peeve of mine when people say “healthy” when you should say “healthful”!! XDthat passion fruit looks so sweet… wah im so jealous! !